As we begin a new trecena under the Day Sign of Transformer/CIMI, we are standing at the threshold of Major Life Change. Transformation and Change will be the prevailing energy over the next 13 days. This trecena includes a number of significant Signs of Synchronicity with planetary and universal cycles that can be drawn from numerology, astronomy, and revelation prophecy. A Total Solar Eclipse marked the beginning of a new era of Spirit. We can SEE the Chaos of Very Major Life Change in all the natural events that have occurred in such a short period of time since August 21, 2017. The fabric of our life is changing all around us. We are reaching a threshold point of Direct Influence. Challenges once observed as happening “far away” are becoming personal. Forces of Nature are becoming widespread enough to directly impact people we know and love. This time is not to be afraid or to be approached as a “disaster,” but a time that calls forth the Higher Spirit of Human. We will be called into Service as the Saviors for Humanity. This is a time we’ve been waiting for, and an important time to Serve from the Altar On High. 4th Uinal – We entered the 4th Uinal of Stability on 9 IMIX of the last trecena. This 20-day cycle is about finding our new foundation and sense of orientation in the Spiritual World. We are called to make this 13-day journey walking in the realm of Spirit. Here we will find Peace, Safety, and Solid Ground beneath our feet. Peak Days of the trecena mark significant times of Spiritual Growth and Transformation, and the Reciprocity between the Above and the Below. 6 Monkey/CHUEN – we are called into the Rhythm, Flow, and Movement of a a Divine Creator, walking in the Truth of our own Magic. 7 Human/EB – will Balance our Human experience of Duality between our physical Consciousness and our Spiritual Consciousness. 8 Reed/BEN – begins our Transformation with the Consecration of the Altar we Built in the Reed/BEN trecena. On the Holy Day of Divine Justice we will receive a new Power to Access Divine Intervention. 9 Jaguar/IX – we are Transformed by Earth Magic, through a Divinely Purified Vibration of Gratitude and Appreciation. Synchronicity with the Haab Calendar: The Transformer/CIMI trecena of this Tzolk’in round falls in the Haab Month of Chuen, the 9th Month of the Haab and a time of correspondence between Heaven and Earth, and the Consecration of Sacred Sites and Altars. This is a time to prepare for GREAT CHANGE. Our “work” will be to maintain the Altar we Built as the Channel of Light we would Draw Down for a Universal Blessing to Humanity. CIMI, our leader for the next 13-days, is a White Day Sign, holding the energy of “Dark.” This is a “working” trecena of Application of Spirit. The Light of New Inspiration is turned off, to facilitate the Wisdom of personal experience that will make evident our Own Light. (We will continue to receive the “Light” and “Dark” through the progression of the Day Signs that will lead the Dance to a Divine Altar.) The Altar Within, established in the Reed/BEN trecena, will be Consecrated through the Wisdom of Personal Experience. We are called to Dance the Dance of Human’s Divine Destiny. We will Ascend the CIMI trecena on 13 Flint/ETZNAB, a day that will drive home an Important Spiritual Truth on the Number 13, that represents our ability to call upon Divine Intervention. The Spiritual Comfort of CIMI exists in stark contrast to our Human Experience, like the polar extremes of Life and Death. Like the transition of childbirth, we see the stark contrast between the Pain of Delivery and the Joy of Birth. The glyph that illustrates Death, is the reminder that something always dies, as something New is Born. CIMI will help us Deliver the First-Born. Humanity will be born into a New World of Spirit. The Signs and Wonders mark this as a time when Human will undergo the experience a First Birth. This is something we’ve never experienced before. We have yet to hold the Wisdom of this Experience. Like a first birth, we will feel the unknown pain of contractions. We need someone with us who can tell us what to expect. We need them to stay there holding our hand, even as we cry out in pain, anger, frustration, and fear of the unknown. We need someone who will remind us what it’s all about… someone who can see into the future, to prophecy a Blessing of Love So Great, it is beyond the realm of our imagination. CIMI holds the power to keep our eyes trained on the magnitude of the Blessing Ahead. CIMI will bring the Gift of Purpose of our Human suffering. A new Spirit Within is being birthed into Light. Only in the balance of Dark and Light, Life and Death, will we experience the magnitude of the Blessing. Tone 1 is the Beginning of a new transformation. 1 is the number of Unity with the Creator. We are called to the Altar for the Inspiration that will help shine a way. CIMI arrives to share it’s vision of the future. This is day for silent reflection to receive the vision we will hold through our climb of Spiritual Growth. The Intentions of both Tone 1 and Tone 2 is the Inner Work of Spiritual Presence in the moment. Because these Tones inspire us and give us direction, we might experience a sense of urgency to take action. We are discouraged from doing so, as the fullness of our understanding for direction is the Highest Purpose for this Time. The Movement of New Life was given it’s own Sacred Time. We are preparing for a birth at Home. Like an expectant Mother who gets the urge to prepare the Home for a new arrival, we can use this time to prepare our Altar. We can dream of the future and layout the clothes to be worn by a Being of Light. We can gather the gifts we would prepare for a Father who will be waiting in the wings to see the birth of his First Born Child. We can Honor the Gift of Life that was seeded for a New Spirit. We can call ahead for Divine Intervention through the Darkness of our Journey. In a Divine Exchange with Transformer/CIMI, we can express our Gratitude and Faith in the Guidance that will be given, and give thanks that CIMI knew to appear in the very moment this help was needed. The tradition of the Sun/Moon Dance was a Vision born in Spirit by Joseph Rael, “Beautiful Painted Arrow.” It was a transformation of the Sun Dance that was wholly designed as a Dance by the Divine Masculine. The Sun/Moon vision was the balancing of Masculine and Feminine, a dance that would be done together. The Dance is a 4-day ceremony of dancing, fasting, and prayer. Dancers reside at the parameter of a circle facing a pole in the center. The path of the dance leads from the outer edge, the place of our Human experience, to the Center Pole, a foundation of Light. Footsteps returning again to the parameter, become the “Tracks of Light” that bring Light to the Walk on Mother Earth. This is the dance we are called to enter. In our times of darkness, we will find our Center by dancing back to the Light. The vibration of our movement brings New Life and Healing to Mother Earth. CIMI’s strength is drawn from instinct and intuition. We will be connected to our own Sense of Knowing what to do in the midst of our critical moments and vulnerabilities. As we walk the threshold between two worlds, we can feel the stronger presence of our ancestors. They are capable to activate our psychic sensitivity when we call on them for support. Our empowerment will come through an Application of Unconditional Love as we Flow (6) with the current of Divine Will. To all my relations, may we mark this time of Signs and Wonders, and Be the Counters see the Divine Purpose for Every Day. May we robe our Altar in White to Honor a Sign of Heaven to be Born on Earth. May we Honor the Joining of the Divine Masculine and Divine Feminine for their equal contribution in seeding the delivery of a New Life. May we layout the clothes we would wear for this Dance. May we make the prayers in preparation as the Gifts we Bring to the Altar. May we surround ourselves by symbols of Light that would remind us of our Place to Go to remember the Vision of our Future. As we light our candles, say our Prayers, and watch the smoke rising to the Creator, may we Kneel in Humility before the Highest Altar, where the Creator eagerly awaits to Witness Us Receive the Highest Gift that was Prepared for Humanity. May we Acknowledge the Signs we see along the way, as the encouragement of the Creator to keep dancing the Divine Dance that will establish an Eternal Connection between Heaven and Earth. May we know that we are One in the Whole of Humanity, the Beloved of God, the first born with the Gift of Divine Consciousness, who are ALL first in Line for the Gift of our Divine Inheritance. And, may we stand in the Faith that we were the Chosen One, the One we were waiting for. OUR DIVINE CHARGE: May we walk in the shoes of Transformer/CIMI to be the comforter to others going through change. May we sacrifice our Self in Service as the One who sees the future, and expects to hear their cries of pain. May we Be the Meek who offer a “soft hand.” May we stay with each other and use the hem of our garment to dry the tears and bring the miracle of Hope through the Light of Purpose as a Blessing that is about to be Born that is Beyond our Human Understanding. Visit the 13-Day Trecena Guide for a daily aspects with insight on the Uinal and Portal Days of the Transformer/CIMI trecena. 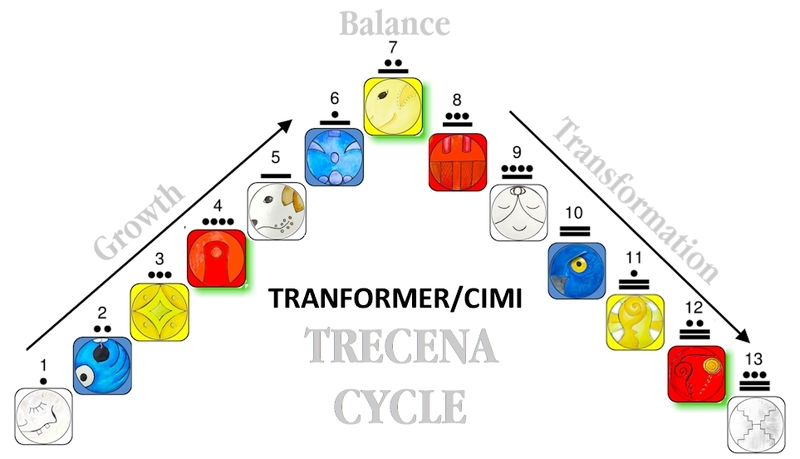 Transformer/CIMI: Cycle of life, death, and rebirth. Transformer persons achieve goals and emotional wealth. Transformer people can become highly respected business persons. They have the ability to help others through any and all transitions with tranquility due to their spiritual strength and guidance. Communities often benefit from Transformers discipline and organization skills. They strengthen the life of pregnant women and guide them through the transitions of maternity. Establishing contact with the ancestors activates innate psychic abilities, gifts to be used as tools to assist others. Transformers can have the ability to send evil intentions telepathically, this is their undoing. From these acts they lose power, easily fall into a victim role and begin to manipulate with a vengeance. A good day to tie all loose ends. 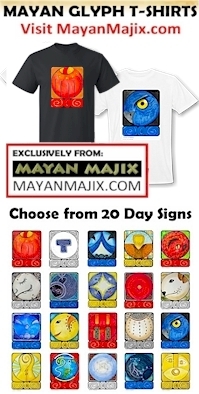 Cherokee, Twins/ TAKATO’KA: Twins symbolize the Female Sun and Male Moon, whose union keeps the world going round. Cherokee myth has the Morning Star heralding the Sun, Venus, also being the Evening Star as representing the TWINS. The energy brings major changes all throughout life, riding the tsunamis of earthquake and upheaval, making their own waves wherever they go. They undergo powerful transformations, alternating like a flashing neon sign. The challenge is to master Balance while experiencing Chaos leading to re-birth and abundance through infinity.